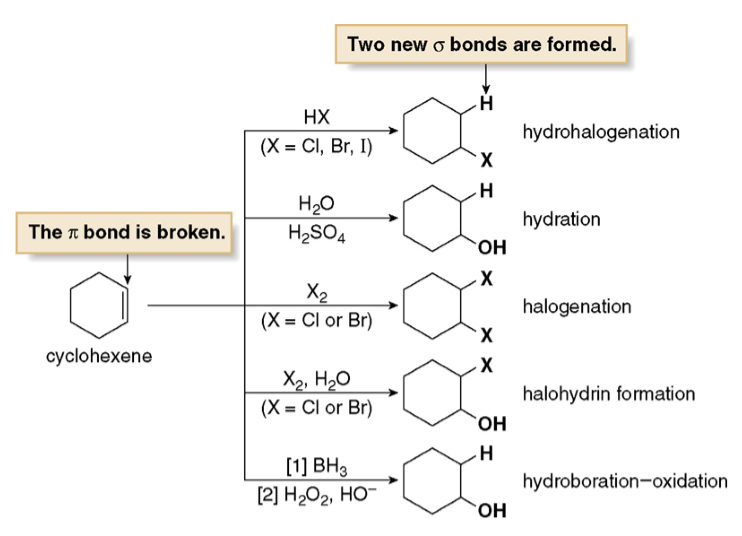 Alkenes are compounds that consist of carbons and hydrogens bonded together with a carbon-carbon double bond. 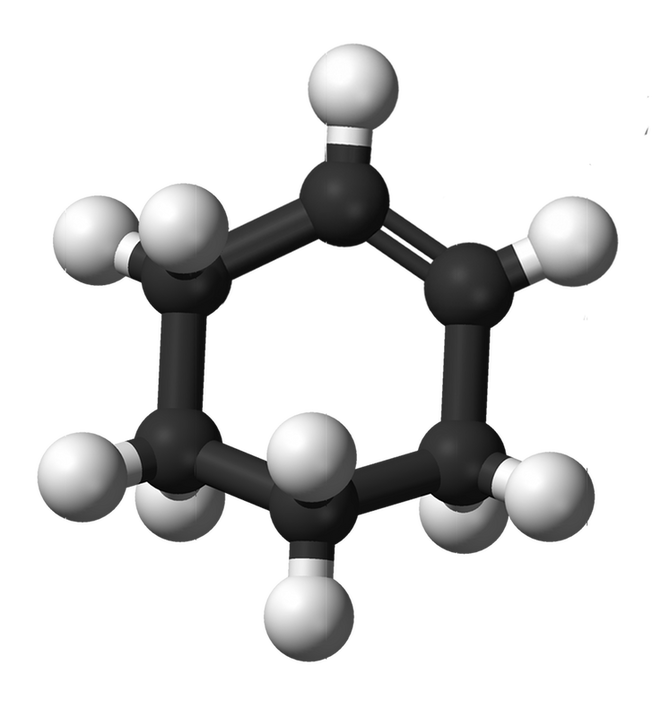 Cycloalkenes are alkenes that consist of three or more carbon atoms linked together with at least one carbon-carbon double bond to form a structural ring (hence the prefix 'cyclo-') as shown below. Cycloalkenes are named the same way that open chain chained alkenes are, with the exception that the numbering is started at one of the carbons of the double bond in order to keep the index numbers as small as possible. Watch the video below on alkenes and cycloalkenes. Skip to 6:02 for an example on naming a cycloalkene. Naming alkenes is basically the same as alkanes with the only difference being that alkenes has a double bond in it's molecular structure, therefore changing the suffix -ane into -ene. Number and list groups in alphabetical order. For rules regarding naming cycloalkanes, please see previous page. Cycloalkenes are unsaturated and therefore have fewer hydrogen atoms and fewer bonds, as opposed to open-chain alkenes, which means that there is less internal energy within the molecule. Like cycloalkanes, cycloaklenes use Van der Waals forces to bond. Macroscopically, most cycloalkenes are liquid at room temperature, though have very low solubility in water. Only the first few cycloalkenes are gases. Cycloalkenes are rarely solid at room temperature. Essentially, cycloalkenes have similar physical properties to alkenes and cycloalkanes aside from the fact that cycloalkenes have at least one double bond. - The smaller the ring, the more likely it is to undergo reactions due to the carbon carbon bond angle. For example, the smallest cycloalkene- Cyclopropene is very reactive and has a extremely high strain. Larger compounds show very little ring strain and are less reactive.